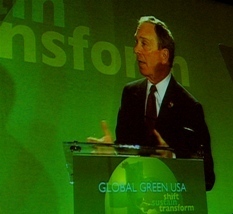 NEW YORK, Dec. 07 /CSRwire/ - December 7, 2007 - Mayor Bloomberg's plan for a greener and greater New York is enjoying a healthy growth spurt with the GoGreenExpo scheduled for April 26-27, 2008, the biggest environmental event in New York history. With free tickets provided to all Con Ed customers who switch to wind power on their bills, the turnout should be earth shaking. Earth Advertising supports the GoGreenExpo by enhancing the experience of vendors, sponsors and the public with green-proof trade booths, innovative media platforms, eFlicks, social marketing, and sales tools designed to push the potential of the New York green economy to its limit. Find out more about special early rates and marketing opportunities available now to showcase your business or organization at GoGreenExpo by contacting Shannon Logue at (212) 933-1391 or shannon@earthadvertising.com. Recommend someone you know who is helping New York to become the greenest city in America, by contacting GoGreenExpo President and CEO, Bradford Rand at brand@gogreenexpo.com.